Overcome the evil demon Gorgon and reclaim the village of Verloren. 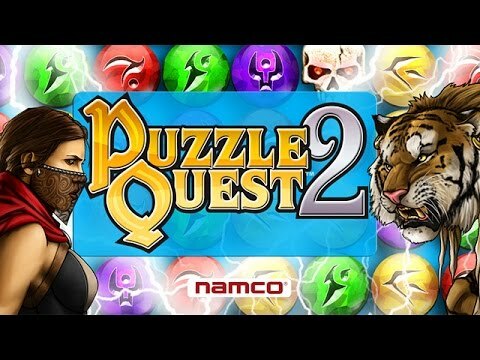 "Puzzle Quest 2 is a tile matching game with additional levels of complexity. The player takes turns playing against a computer opponent. This makes it difficult for the player to set up long chains and combos, because this would allow the opponent to benefit from them; so there is a measure of defensive action. Even though the heart of Puzzle Quest 2 is a gem matching game, it is presented as an RPG. The battles that take place pit the player against an opponent with hit points, equipment, and abilities. The player earns experience to gain new abilities and gold to purchase better equipment. Your opponents also have a list of abilities they may use. This can change your strategy from collecting what you need, to collecting what they need. There are a number of different opponents, so the options that your opponent changes frequently. This game is excellent for those who enjoy gem puzzle games, but want a greater challenge. The RPG elements make the game unique and re-playable." In Puzzle Quest 2, you'll enter a puzzling fantasy world of amazing creatures and powerful weapons. Embark on your adventure as a Sorcerer, Templar, Barbarian or Assassin, and customize your character with magical spells and abilities to earn treasures. Use your roleplay, mini-games, and match-3 skills to overcome the evil demon Gorgon and reclaim the village of Verloren.